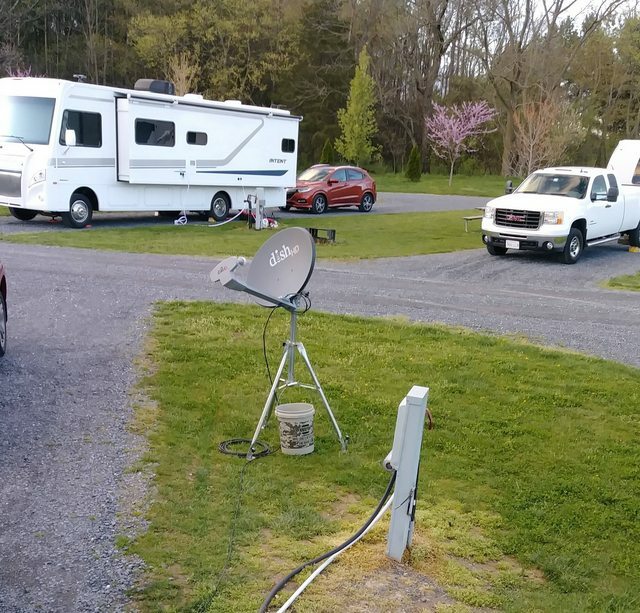 RV.Net Open Roads Forum: Technology Corner: Any DIY dish mounts? > Any DIY dish mounts? I've never liked the flimsy little tripods and wondered if anyone designed their own simple but effective dish mount. (Looking for ground mount). I use a roof mount tripod antenna and screw it to the ground with lag screws. Yes, I made my own, which served very well for a number of years. Sadly, all the pictures have been deletedbut if you will PM me, I will tell you how to make one very cheaply. Also, I have seen ones made from Plastic pipe that are very compact, lightweight, and easy to travel and store. Most are made to use the dish inverted, laying on its back, which makes it very stable. Like said, PM me for instructions on how to make one very cheaply. I used to use one like this when I used Directv SD. Leveling wasn’t important for that dish. When HD took over, I switched to a surveyors tripod and made a mount. Rock solid, easy to level and light. Is a bucket of concrete stable enough in wind? 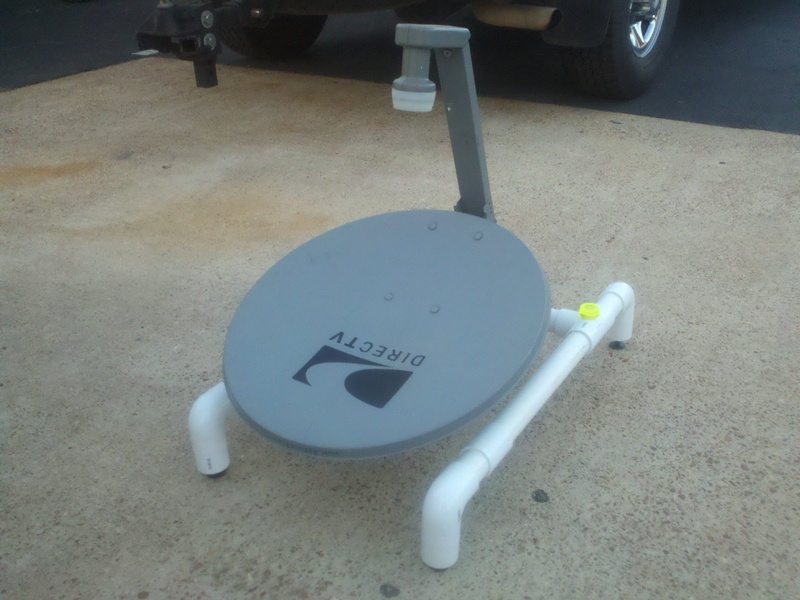 The dish will be a DirectTV HD Slim Line. Wind has been my biggest concern with any design. The surveyors tripod has pointed feet with a foot step which lets you push it an inch or two into the ground. I never had it blow over. Remember the legs are long so the feet are feet apart. Very stable. A bucket of water or a few plastic bottles of water would be plenty. I used it with a Slimline. I switched to DISH with an auto align Winegard Pathway. I've used our modified $25 tripod for almost 10 years with no stability problems just using a half full 5 gallon pail for ballast. The photo below shows our setup right now that withstood up to 50 MPH wind gusts today in Virginia. I've learned the hard way you need to make sure the wind won't flip the dish over. Can't always drive stakes into the ground so I bought a base for a patio umbrella but doesn't hold quite enough water to help much. I wish there was something more elegant than using a 5 gallon pail or heavy concrete blocks. The idea of the inverted dish closer to the ground is a good idea. Making a clamp that attaches to a picnic table is about the only other option I can think of. Except that sometimes CG picnic tables are old and rotten and/or wobbly. I hate CAPTCHA. CAPTCHA sux. CAPTCHA is evil. CAPTCHA needs fixing.